First of all the shower: there is a shower fixture, but no shower enclosure. Eventually I figured out (I think) that the whole bathroom is supposed to be the shower. The floor is slightly tilted to one corner so everything drains there. It does mean that one either has to move their reading material out of the bathroom or be careful with the shower nozzle. But the BIGGEST mystery to me is the sprayer (like on a kitchen sink) mounted NEXT to the toilet. I have no idea what that is for. 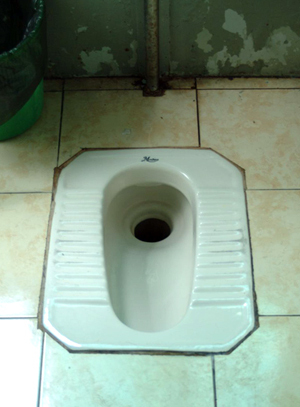 I spent many hours thinking about it, and finally came to the conclusion that it must be some sort of bidet thing - given the French influence in Vietnam. So what do you think the sparer is for? It’s been more than two weeks since I arrived so I decided to give it a try - which I did. It wasn't a very pleasant sensation - sort of like a turbo charged enema, with water spraying everywhere which precipitated in a total change of clothes. Later in the day I recount my experience toPhilip, my Vietnamese travel agent who collapses laughing. He actually falls on the sidewalk laughing with tears streaming down his face. He then tells the people who have gathered around him who also collapse laughing. Evidentially the little sprayer replaces the "toilet brush" we are all familiar with in North America. After you do your business you use the power sprayer to clean up any aftermath. So be warned of the mysteries of the Vietnamese bathroom. Off right now to "Whale Island" for two days then onto Saigon. Today is supposed to be "bone easy." The boat takes me to the beach; the van takes me to the airport; the plane takes me Saigon. What could possibly go wrong? My ride to Whale Island is late, which begins the day half an hour behind schedule. But not to worry, I have built a lot of extra time into the schedule. I’ll still make my plane with plenty of time to spare. Ten minutes down the highway, the van blows out not one, but TWO tires! Now we're going to be even later. The driver does his best to hurry things along, jacking up one side, then the other. It feels like that since he has to take off two tires - all this in 35 plus degree temperature on an asphalt road. After 30 minutes he accomplishes the repairs, gets into the van, drives a mile down the road and promptly collapses unconscious on the steering wheel. It appears he's had a heart attack!!! Fortunately he stopped the van (in the middle of the highway) before collapsing. sim card). I call Philip, my travel agent, in Nha Trang who contacts the resort I just left. There is no rural ambulance service. However I walk over to a house across the highway and there is much chatting between Philip and the homeowners. It is decided that we should carry the unconscious driver to the house to wait for medical help. In the meantime I drive the van to the side of the road - big mistake! Now everyone knows I can drive, and it is suggested I drive the unconscious driver to the nearest hospital back in Nha Trang a short two hour drive in the opposite direction. Not only have I know idea how to get there, but I doubt I’d get two miles before I have an accident. Fortunately for all concerned a few minutes later two guys on a motor-bike ambulance arrive and one of them takes over driving the van to the hospital while the other gives the unconscious driver CPR. We drop him at the hospital and then the plan is to now take me to the airport - but I point out we are way too late - the flight will have gone. I call my travel agent to rebook the flight and am told my scheduled flight has been delayed an hour by weather, and so I actually make the flight with just minutes to spare. Of course I found out a half hour later what the weather problem was as we arrived in a humongous thunderstorm - which we immediately fly into - that’s par for the day. Tomorrow, I'm off to the remote Can Dao Islands 45 miles offshore for 4 days of diving and R&R. Vietnamese give their children names that mean things, but despite his name, Mr. Ha, is not a happy man - especially where I'm concerned. He seemed very happy when he picked me up at the airport but he's soured on me. When Mr. Ha moved out here 15 years ago, he wasn't sure whether it was as a reward or punishment. He'd been a loyal party member for years, so he wasn't sure what to make of his "exile" to the remote Con Dao Islands. The Con Dao Islands were devised as a prison - somewhere to exile, torture and execute the pesky Viet Minh who weren't appreciating the glorious French colonial policy. When the Americans entered the scene in the 60's, they thought why let a good place like Con Dao go to waste so they upgraded it by adding the infamous "tiger cages" and shipping a whole new generation of pesky Viet Cong there, until they were caught red handed torturing prisoners and crossed their hearts said they would never do such a thing again (Can you spell Guantanamo?) . When they left they abandoned the islands. The Con Dao Islands are very remote, and to date are only visited by Vietnamese vets who were imprisoned here, wandering biologists (It's a nature reserve) and the very odd tourist. 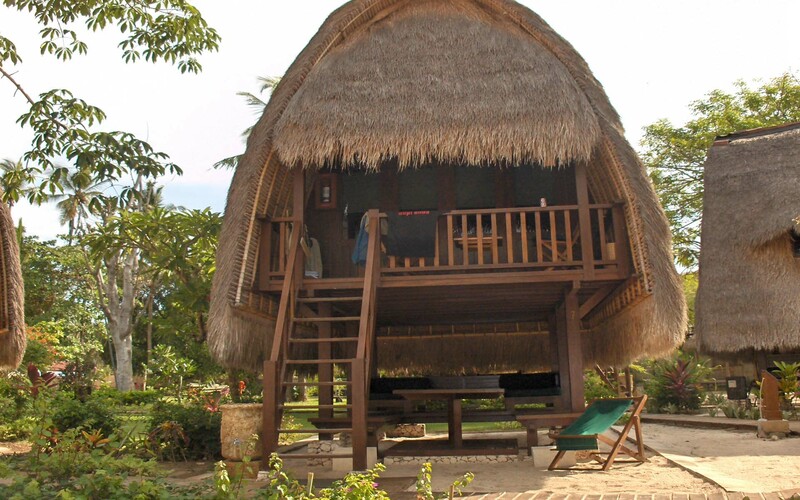 Mr. Ha, maintains a small hotel, which consists mainly of "stilt houses" - that were built during the French era. He was given a small workforce to maintain the hotel and exotic gardens, and had a spotless record back on the mainland - until I arrived. It all started when I checked out of my hotel in Saigon- they insisted that I had to pay for my room. I told them I had prepaid and things sort of went downhill from there. As it was 6:00am I couldn't raise my travel agent on his cell phone so I just left – with them screaming at me and threatening dire circumstances – something about tiger cages. When I got to my room on the Con Dao islands, I finally got through let him know how unhappy I was. But I was so upset – I got the hotel names reversed and told him I was upset with the service at the hotel I was staying in on the Con Dao Islands. This may sound farfetched, but it’s not the first time I’ve had that problem. The previous summer I was annoyed with my neighbour who continually flaunted the summer sprinkling regulations. I finally got up my courage and called up the city to complain. Unfortunately instead of giving them my neighbour’s address, I gave them mine which resulted in ME getting a sprinkling fine. I turned myself in! In a lot of ways the Con Dao islands are a throw back in time. At 5:00 am an air raid siren sounds, letting all the good communist workers know it's time to get up. Then follows ten minutes of exercise blared through tinny speakers scattered throughout the whole island. The effect of all these scattered tinny speakers is the feeling that you're in an echo chamber. Following the exercise there are 20 minutes of stirring party propaganda. Three times a week Mr. Ha gathers his workers into the dining room for an hour of rousing propaganda. I happened to interrupt one of these. The twenty or so workers seemed enthusiastic, cheering at appropriate moments, applauding, and thumping their ice tea mugs on the tables. Of course the alternative would be to be sweating out in the gardens in 38 degree heat, digging ditches, or worse- doing my laundry. I saw what I thought were frosty mugs of beer in front of everyone, so thought if there was free beer I'd sit in. Unfortunately it was iced tea, so I excused myself and retired to my mini-bar. what's about to befall them. 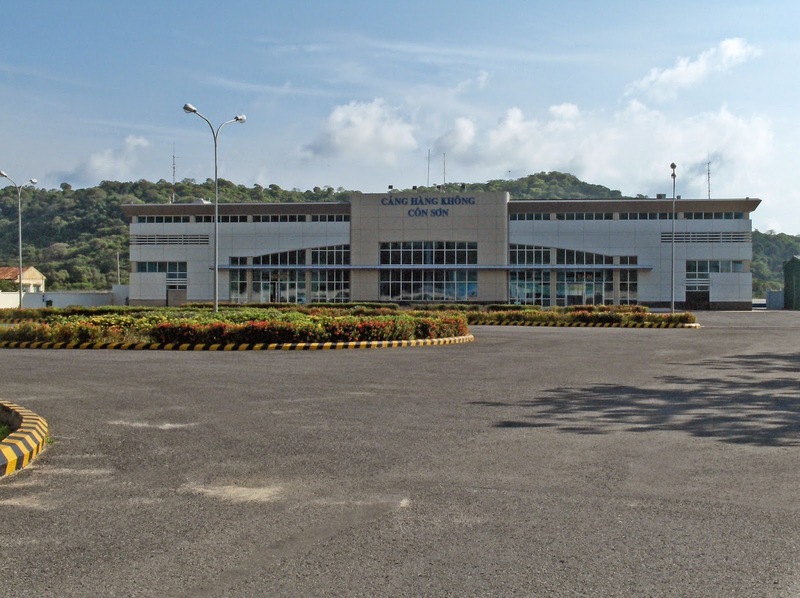 The Vietnamese government has built a BIG new airport (the old French one was the size of a phone booth), put in a state of the art Control Tower, and Fire station. Word is they are about to lengthen the runway to accommodate much larger planes. And they'll need too. The new airport - but where are the planes? Right now there are two huge five star hotels half way through construction and several more about to break ground. They've already built a beautiful divided beach road that runs for miles along the waterfront to accommodate what? One bike and motorbike every twenty minutes or so. As one of my diving colleagues said: "Jeff if you get hit by anything crossing the road here, there's something seriously wrong with you." The Vietnamese know that Con Dao will be "the next big thing" in Vietnam and are working fast to cash in. I think in five years or less this sleepy little island of dilapidated French villas will be full of big hotels, fancy cafes, and Karaoke bars; so if you want to see Vietnam like it once was, you should plan to visit Con Dao sooner - than later - just don't mention my name. Two more days here, then back to Saigon (Mr. Ha HATES it when I call it that - nobody else cares) and some last minute shopping then hoping there's room on the plane home. NEXT: On to Thailand and I have a tiger by the tail!